The perfect Valentine’s Day recipe created by Snixy Kitchen! 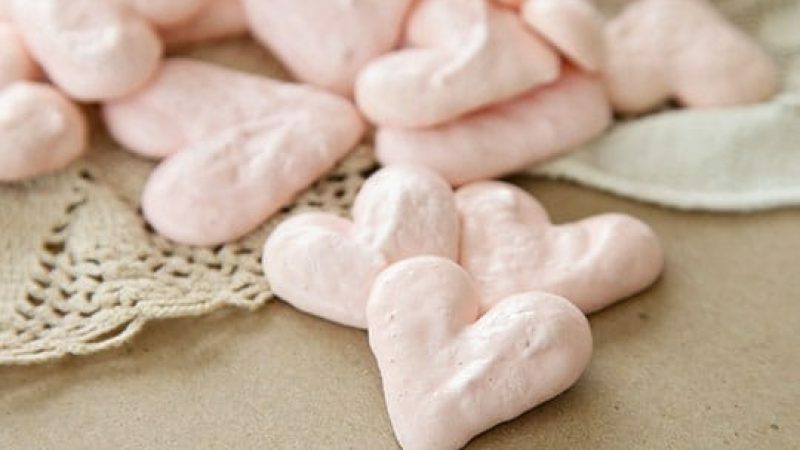 These heart meringues taste like sugary bites of love and are the perfect way to tell that someone special you’re thinking of them! Combine the egg whites, sugar and cream of tartar in a double broiler over simmer water (or in a medium heatproof bowl set over a pot of simmering water, making sure that the bottom of the bowl does not touch the water). Whisk mixture continuously until the sugar has dissolved and the egg whites are warm to the touch, about 3-5 minutes. Strain the mixture through a fine metal sieve into the bowl of a stand mixer fitted with a whisk attachment. Which on low-speed, gradually increasing to high-speed until soft peaks form (about 5 minutes). Add Rodelle Vanilla Extract (or extract of choice) and, if using, food dye, and continue beating on high-speed until stiff peaks form (about 2 minutes). Transfer the meringue to a pastry bag fitted with a wide tip (or, a Ziploc bag with a hole cut in the bottom corner for a pastry tip). Pipe 2-inch hearts onto a parchment-lined baking sheet. You can use a toothpick to adjust the shape of the hearts after you’ve piped them. Bake until crispy on the outside and soft on the inside, and 1 1/4 to 1 1/2 hours (Taste one after 1 1/4 hours to check whether they’re done), an remember: do not open the oven door during the first hour the meringues are baking). After the meringues are done baking, turn the oven off and open the door to let meringues cool slowly in the oven (or eat right away because they're so delicious!). Note: Click here for the original post from Snixy Kitchen!